Herbal Essences Cucumber and Green Tea Dry Shampoo is crafted with bio:renew, a signature blend of essential antioxidants, aloe and sea kelp, designed to help purify and protect against impurities. 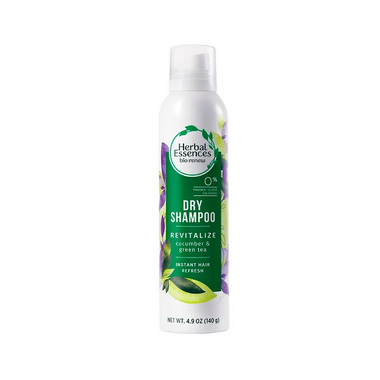 The dry shampoo instantly absorbs oil and boosts scent for a waterless wash that leaves no excess residue. From the first spray, our Cucumber and Green Tea Dry Shampoo will take you on a fresh multi·layered scent experience. Immerse yourself in the scent of green leaves followed by delicate water lilies and clean amber. Shake first then spray on hair, working into roots. Brush out and style as desired. For even more stunning hair, use alongside Cucumber and Green Tea Shampoo and Conditioner with bio:renew. Shake first then spray on hair, working into roots. Brush out and style as desired. Get a 1st day clean feel in·between washes. Contents under pressure. Do not place in hot water or near radiators, stoves or other sources of heat. Do not puncture, incinerate or crush container or store at temperatures over 50oC. Do not use in the presence of open flame or spark or while smoking. Use only as directed. Avoid contact with eyes. Keep out of reach of children.